A frustrated Kakapo parrot !!! I attach a link to the bbc 2 programme with Stephen fry and Mark carwardine and a Kakapo parrot. So click onto the title and watch the video for yourself. Where has the time gone, its well over a month since I was on my blog, so I thought I enter something. Currently been very busy at the project group, seams that the flood gates have opened on commissions, not that we are complaining. I just had a one to one workshop with a customer, who wanted to make a 2ft circle panel in glass to go into a current 3ft hole that she has in her home, which turned out to be a success. On Saturday the 22nd of August, I decided to pay a visit to Shropshire Cat rescue, to see how the new Cat retirement village was taking shape, and also to see the vast number of cats they currently have in. It was on the second part of the visit i was introduced to Charlie who had been in the rescue for just over a month, and therefore being the big softie that I am, Charlie is not at the rescue anymore but at home with me. 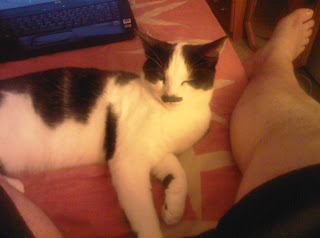 As you can see from the picture as to why she is called charlie!!!!! she is also just 18months old.. I made the mistake of going to morrisons on the day they opened, and was amazed by not the amount of people they had in the store, but at the way the store was laid out. Comparing to the layout that somerfields had, Morrisons really have quashed in the shelving, making it very enclosed. It would be very interesting to know what the total food capacity is for both the current and past supermarket. With that total, and the amount of space that Home bargains (which opens on Saturday) covers , surely with these fiqures in mind it must take it near to the proposed amount perdicted, to serve Oswestry in the future. So, With the proposed plans for another supermarket to go to the planners soon, I hope they take on board these fiqures. With the opening due tomorrow 2nd July 10.30 am, a group was down at the Nursery to just finish of a couple of things that were outstanding, ie gate, flags, project group stepping stone filter for pump.Then again it could be just to top the tan up!!!!! 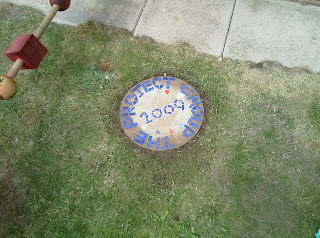 Photo above: A stepping stone made by Carolyn at our group as a signature for the work we have done. 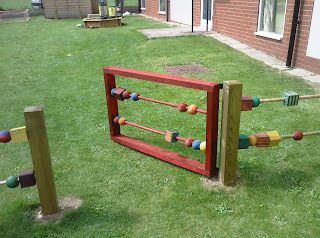 Two photos above: shows the gate I recently made, designed to keep the children divided. Below: See-saw with flags mounted. 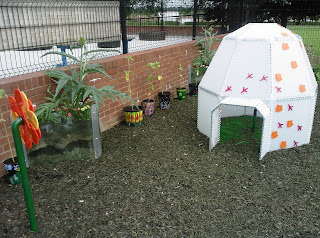 Photo Below: Showing the completed Igloo with one of the Talking heads in the foreground ,the well stocked raised border being complemented with 11 painted pots(painted by members of the project group) planted with a sun flower. WE ARE GETTING THERE !!! 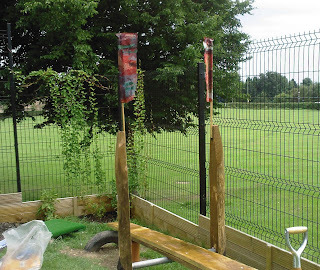 Its been over a week since my last update on the sensory garden project, and how things have now moved forward, and coming to its completion, with the official opening happening on the 2nd July 2009 ( so look out for your invitations). So who needs those make over programmes !!!!!!!!! Below the Sew -saw water pump (near Completion) and below the Xylophone. Below : shows one of the Borders well stocked (thanks to the hard work of our own Chief Plant person Rachel Curties). Photo`s show: Top to Bottom. The two main uprights supplied by http://tomtheappleman.wordpress.com/ and the metal bar by Steve davies have been installed and the lower(shorter blank) fixed to the cross bar. Awaiting to be fixed to the longer board by bolts. This will hopefully be done on friday. 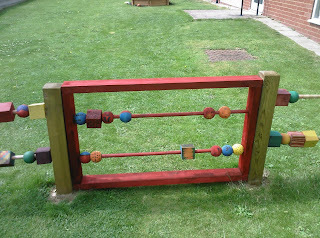 Also today we had a team working on retouching up the balls and blocks on the abacus..... or was it a case of topping up the tan!! 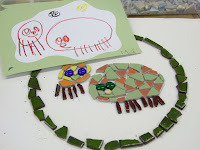 Is the date of the opening, and invitations will be going out to all those who have either worked,contributed or parents who have children at the nursery. So watch out for yours !!!!!!! !